Milwaukee Airport Hotels Parking Package Makes Travel SimpleWelcome to the Crowne Plaza Milwaukee Airport hotel, located off I-94, just under three miles from General Mitchell International Airport and less than 10 miles from downtown. Ideal for discerning business and leisure travelers, this upscale hotel offers the most contemporary full-service accommodations among Milwaukee (MKE) Airport hotels.A convenient airport location, free airport shuttle, a Parking program and more than 24,000 sq ft of event space make our hotel ideal for business conventions, meetings and weddings. A two-hour response guarantee for all event space inquiries and a professional Crowne Meeting Director, who will lead your Daily Meeting Debriefs, make event-planning easy for our hotel's guests.Milwaukee, WI leisure travelers enjoy easy access to area attractions, including the Milwaukee Art Museum, Milwaukee County Zoo and Harley Davidson Museum. Miller Brewery Tours or a Brewer's baseball game at Miller Park also promise to be entertaining endeavors, and events like Milwaukee's Summerfest music festival and the Wisconsin State Fair are held just minutes from the hotel's property.Few Milwaukee, WI airport hotels promise "Park here fly there" in addition to such amenities as Crowne Plaza's Sleep Advantage Program, an indoor pool, Fitness Center, 24-hour Business Center, concierge service and IHG Rewards. We hope to see you soon! Altitude Restaurant: Altitude is the latest gastropub concept featuring locally sourced products, highlighting Wisconsin heritage. Milwaukee is known as the Brew City and we feature many local microbrews including New Glarius, MKE Brewing, Explorium Brewing and more. Starbucks "We Proudly Serve" Coffee Bar: Our in house Starbucks We Proudly Serve cafe features a full line of Starbucks beverages included espresso and Frappuccino. A full line of breakfast sandwiches, pastries and snacks are also provided. 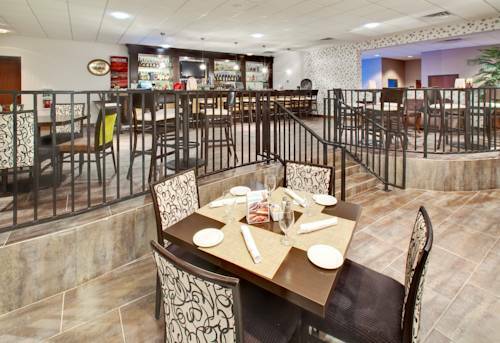 Altitude Bar and Lounge: Take a moment to relax with colleagues or friends at Altitude, our hotel's lounge. Enjoy a cocktail, local craft beer and lighter fare during the lounge's extended hours. Concorde Ballroom: 12,000 square feet of flexible meeting space with 14 foot ceilings and built in dance floor. Ballroom can be divided into 3 smaller equal sections of 4,000 square feet each. Concourse Meeting Room: 2117 square feet of flexible meeting space. Meeting room can be divided into 3 smaller equal rooms of 706 square feet each with 10 foot ceilings. Voyager Ballroom: 4032 square feet of flexible meeting space with vaulted ceiling and built in dance floor. Private room with separate enterance and private restrooms. Aviation: Stadium style seating for 130 in this 1,696 square foot theater. Passport: Private dining room off of the main restaurant. 440 square feet of flexible meeting space for groups up to 40. Oakwood Golf CourseOakwood is the longest in length of Milwaukee County Parks' courses with generous landing areas and accessible but undulating greens. Four sets of tee boxes allows it to be enjoyable for a golfer of any skill level. PGA Pro onsite. Must make reservations. Whitnall Park Golf CourseLocated in Milwaukee County's largest park--640 acres--this championship layout will challenge even the best golfers. Large trees line the fairways of all 18 holes of this heavily wooded course. PGA Pro onsite. Must make reservations. Warnimont Golf CourseWarnimont Park Golf Course is an Executive Course that plays just over 2,700 yards. This course is ideal those who want to practice their short game or enjoy a fast, fun round. Beautiful views of Lake Michigan make this a very nice place to play golf. Ives Grove Golf Course & Golf SimulatorsDesigned as a links-style course, players encounter 110 bunkers, nature areas and rolling greens. Featuring outstanding practice facilities, fully stocked pro shop and 2 golf simulators to keep you golfing year round! Harley Davidson MuseumCompelling exhibits. Behind-the-scenes tours. Rocking events. Hands-on fun for kids (and adults). All rooted in Harley-Davidson s rich history. There s lots to see, lots to do, and no reason to wait. Plunge in. Summerfest11 Days, 11 Stages, Over 800 Acts, Over 1,000 Performances. For 11 days, more than 800 acts play across the 11 stages featured on the grounds. On any given day, attendees can enjoy alternative, rock, country, R&B, pop, reggae headliners and more. Potawatomi CasinoLocated minutes from downtown Milwaukee, Potawatomi Casino offers high-stakes bingo, over 100 table games, over 3,000 slot machines, a 20-table Poker Room, a 500-seat theater featuring many headliner shows and an Off-Track Betting Room.